The tray comprises a thermoformed transparent lid and an opaque base tray made from Radel PPSU resin. 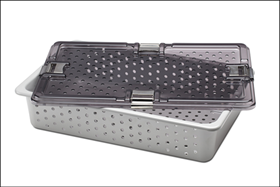 The tray, produced by sterile case maker Legacy Medical Solutions, measures 59.7 x 38.1 x 14.2 cm, and comprises a thermoformed transparent lid and an opaque base tray made from Radel PPSU resin. Solvay says that the base tray is up to 50% lighter than competitive models fashioned with anodized aluminum. The material is compatible with all commercial sterilization methods, including repeated autoclaving at 280°F (138°C) for sustained periods of time. ‘Today’s sterilization trays need to withstand punishing autoclaving protocols with high pH cleaners through hundreds of sterilization cycles,’ said Joel S Hughes, president of Legacy Medical Solutions. Solvay says that its Ixef polyarylamide (PARA) resin was used in the development of a single-use bone staple kit.